Unveiled back in the fall of 2017 alongside its premium iPhone 8, 8 Plus and iPhone X flagships, Apple’s revolutionary AirPower charging mat was slated for release sometime during the first part of 2018. The company’s Qi-based wireless charging solution (flaunted for its unique ability to power-up an iPhone 8/X, Apple Watch, and AirPods wireless charging case simultaneously) has been seriously delayed, however. And though the most recent reports had suggested it would be coming in March, and then April, here we are rolling into May without so much as a clue as to where AirPower is or when it will launch – let alone how much it will actually cost when it does. 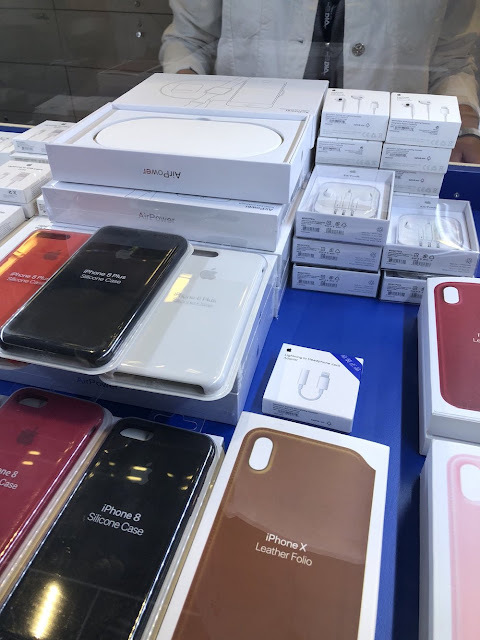 Unsurprisingly, given its delay, AirPower has apparently become a hot-button commodity amongst purveyors of China’s vast counterfeiting enterprise. Over the weekend, it turns out that one of these knock-offs was spotted and photographed by Twitter user Peter Allen, who, while traveling through the Vienna airport, wound up mistaking the knock-off AirPower changing pad units as authentic when in fact a multitude of signs proved otherwise. 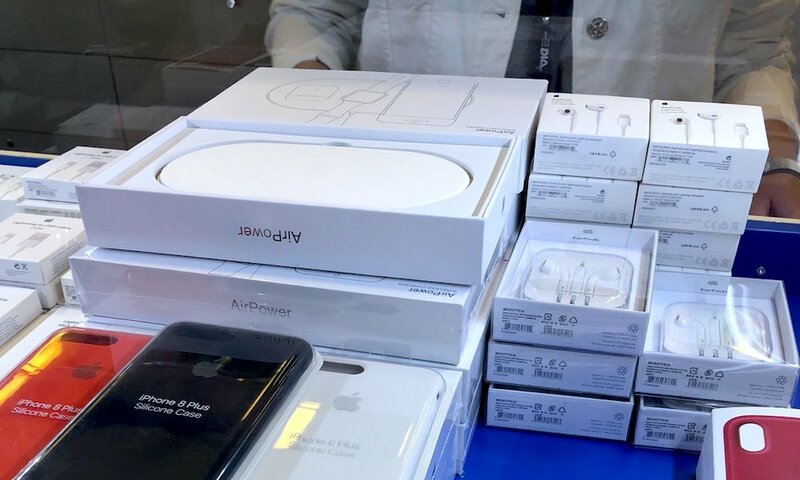 Allen, in a Tweet published to his official Twitter account and first spotted by The Apple Post, said the AirPower look-a-likes were being sold amidst a larger collection of seemingly authentic but inherently fake Apple products, including AirPods and iPhone cases, for a whopping $200 apiece. However a closer look at the packaging gives off a number of tall-tale signs that these products are fake. For example, AppleInsider notes, “some of the Apple product packaging is off,” referring specifically to all the “Chinese labeling on the Lightning to headphone jack adapter in the center of the picture.” There’s also clear discrepancies in how the U.S. and Chinese FCC designations appear on the external packaging itself. Moreover, the exact same (or a very similar looking) AirPower charging mat was recently discovered for sale via several online channels including eBay, AppleInsider noted. Of course, as of Monday morning, Apple has neither announced when its authentic AirPower mat will officially go up for sale, nor said so much as a peep about the cost.. We can rest assured though, that when it does launch sometime this year, AirPower will not cost $274.